An interesting reflection, Your house is threatened by fire. You have time to grab one thing. Let us assume that all people, pets, and stock certificates are safe! What do you save? Describe it to us. A physical description. Tell us its story. Where did it come from? What does it mean to you? How did your family come by it? So many treasures, which one to choose? I am torn between two items, both of which I associate with my father’s family. Narrowing to one, I choose the pocket watch. It came into my possession one winter afternoon, several years ago. My father had come for a visit. Just as he was about to leave, my father reached into his pocket and placed a pocket watch into my hand. “Keep this,” he said. “I want you to have it.” I paid little attention to it. The pocket watch lies in a blue dish, situated on top of the front hall table. My grandmother, Alice’s table. Odd, that the pocket watch ended up on this table, as I didn’t thoughtfully plan its placement for aesthetic reasons; I simply placed it there. The pocket watch lies close to the front door, as if not certain of where it belongs. Will it stay? I hold the pocket watch in my hands, examining it. The round, silver case is slightly tarnished. It is classified as an open face pocket watch. “DAX,” manufactured between 1927- 29,  also known as a dollar watch, made to be affordable and durable, designed for the working class man to toss into his pocket. To be tossed away when it stopped keeping time; it was considered non repairable. The silver case is rounded and flattened without sharp edges. At the base of the clock face there is a sub second dial, located at six o’clock that denotes the seconds. The words, WESTCLOX, DAX, SHOCK RESISTANT, are printed in upper case letters. The clock face is made of white paper with bold black numerals; the clock hands are black and have sharp pointed ends. Researching this item, I discovered that the factory where these watches were produced indicated that, historically, women worked in watch factories, later painting the numerals and hands with a “glo” paint. They would lick the tips of their brushes to fashion a point resulting in radium poisoning. This would be the beginning of worker’s rights and safety legislation for women employed in factories. The glass front has three faint scratch marks. The pendant clasp is located at twelve o’clock. Attached to the clasp is a gold chain, with a fastener to slip through a buttonhole. Someone has added this feature to the simple pocket watch. To set the time, one must pull up on a small stem at the top of the clock, set the time, and back wind. The watch has fallen silent. Occasionally, when held it will tick. I have discovered a way to get DAX to reluctantly and briefly keep time. If I tip it gently, lift the tab, and slowly back wind, I can hear the sound. The precise tick, tick, is comforting, soothing my heartbeat. I will it to life as if that will bring those I love back to me. I have so many unanswered questions to ask. DAX teases me and resists, halted. Time pauses. “Hold me,” it whispers. A memory. I see my father. It is the late 70’s. The pocket watch’s golden chain is extending from the vest pocket of his stylish, three piece, pinstriped suit. I recall how modish and debonair my father was. Perhaps, the pocket watch was an item that held memories, possibly treasured, now handed into my care. For many years, I have attempted to ignore the pocket watch, passing it by as I made countless trips past the front hall table. Many times I have considered removing it from the blue dish on the table. Time has passed, days to weeks, weeks to months, and months have become years. The pocket watch remained silent. Occasionally, I would stop and pick it up to study the locket attached to the chain. In that moment, time would briefly stop as I let my memories surface. There are two pictures inside, one of a pretty, fine featured woman, bobbed hair, head tilted down, eyes cast to the side. She is shyly smiling at a man. The pose is familiar, my grandmother, Alice. The man standing beside her is my grandfather, Tom. He is handsome, the most beautiful eyes. Wearing a simple white shirt with suspenders, he is smiling, a sideways grin, proudly facing the camera. They look happy. The second photograph is of my father, their son. He has a clipped beard; it is beginning to grey. Facing the camera, his eyes are twinkling and focused. My father always smiled with his eyes, and if you looked long enough, they would reveal a vulnerable, gentle heart. The golden chain is puzzling, an attachment. Where did the chain come from? It is far too elegant for the simple DAX. Who owned it? The initials on the locket front are inscribed, TS, my paternal grandfather. I assume that grandfather owned the chain and that someone had carefully placed the photograph of his wife inside for safekeeping. Who placed the photo of my father into the second compartment? Precious. You are worthy; I will protect and keep you close to my heart. This explanation would suit what I recall of my grandfather. Once a week, on a Tuesday, just before noon, we would meet at his sister, Isabella’s home. Bella would prepare a hot lunch. My grandfather would take us for a drive to a nearby provincial park. It was such a simple event, driving the tree lined gravel roads in a car, we let time slow down. Isabella had a brief reprieve from her daily reality, protectively caring for and managing her adult son. Afterward, my grandfather would drive Bella to the local shops to do her banking and shopping for the week. Always, my grandfather would stop and buy us ice cream. That was our routine; we followed it without failure. My grandfather was protective, and demonstrated care through simple gestures. Driving home I would see grandfather’s red Valiant station wagon pulled to the side of the highway where he would be standing, hat in hand, waiting for me to drive past. As I drove by, toward the turn off for home, grandfather would nod. We would wave, our signal for “all is well, see you soon.” It was a simple, yet profound gesture, I have never forgotten. 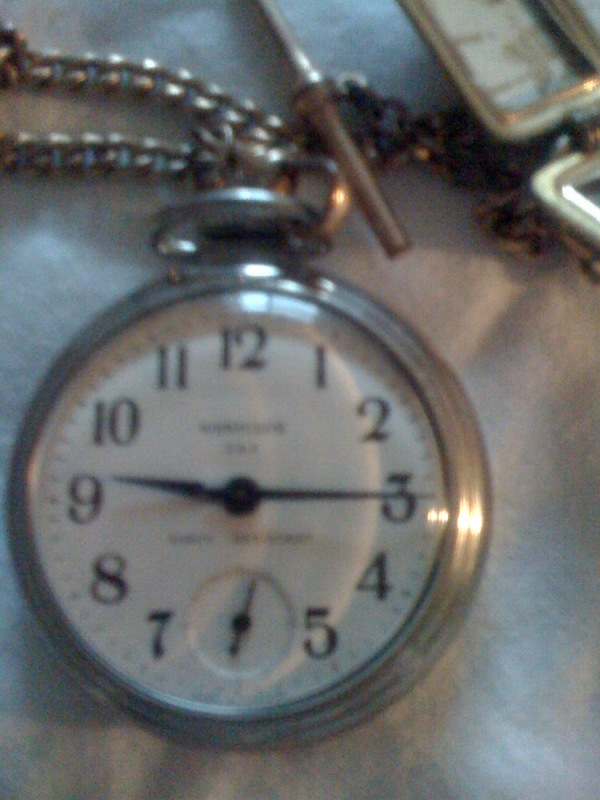 What was my father trying to tell me through the gift of the pocket watch? That time passes; that we were running out of time, or that family time is precious? Birthdays and Christmases would come and go without a card, gift, sometimes not even a phone call. I would always wait for his call. I would make him wait for mine. We began to keep a glass wall between us, our conversations becoming cautious, polite, yet, our goodbye hugs told the truth. My father never apologized, “I’m sorry if my actions hurt you.” I never asked him, “Why?” It seemed so unlike him to stop being responsible and present in our lives. Wasted moments. We thought that we had forever to make amends. Our love was true. Now I am the keeper of my father’s pocket watch. It doesn’t faithfully keep time, it’s flawed, mismatched, and it’s worthless. I never speak these words, however, I would be lying if I wrote that I did not think them. I simply smile, hold it tightly pressed to my palm and thank him. I am ashamed to write these words for when I look back upon this action, I can see that my father was demonstrating a simple act of kindness, a reaching out of sorts through this simple gesture, bestowing a watch. Perhaps even trying to tell me that he was sorry for all of the misunderstandings, sadness. Although, worthless to some, the pocket watch evoked memories that he wanted me to treasure. The circle shape, a symbol of eternity is fitting for the pocket watch. It would link me to family, grandparents and back to my father. It belonged with me, an unbroken circle. Perhaps, as simple as my grandfather’s endearing wave, the modest pocket watch was a symbol for eternal love and the chain, a symbol of joining together, of holding on to another. I am getting older and I know this; “time waits for no one” and we run out of opportunities to demonstrate care for one another, to get a second chance, to share one more minute. Eventually the clock stops ticking and it becomes too late. Now, I am the timekeeper, life is fleeting. Gently holding the pocket watch, I remember the good times, the sad, the importance of forgiveness, to seize opportunities, to live in the moment, and to love. I am careful to honor and respect time. I choose family, always. I hold my grandchild a bit more tightly each time we say, “So long.” It is important to me that the child knows love, in a world that often forgets. One day, the pocket watch will be passed to another member of the family along with this story. I shall choose wisely whom to bestow it upon.